A Core Drilling Machine is a machine, which drills holes or shafts in the ground. 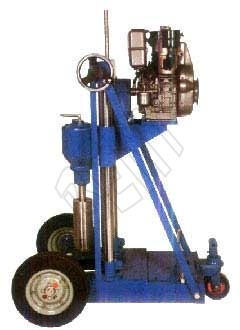 This Core Drilling Machine is used to drill cores on Bitumen Pavements. The Core Drilling Machine is an important construction site tool. We are one of the leading Manufacturers & Suppliers of these units. The machines we supply are manufactured using the best raw materials to ensure their good functioning and durability. The machine is available with a hand operated rapid screw feed by lever drive having built in ball bearing. It consists of drill spindle that floats on tapered roller bearings. Herein the water swivel is completely enclosed and mounted on the drill spindle. The drill drive shaft is mounted on two ball bearings in the drill head. The drill is available with water tank to offer the water to the cutting functions, which is mounted on a sub base and is further mounted on a trolley. When comes to trolley, it is mounted on scooter tyre wheels and leveling screws thereby allowing easy shifting and setting. The machine is attached with a Diesel Engine. It is supplied with 100mm or 150mm dia. core bit.